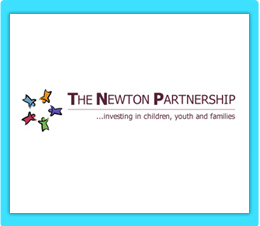 The Newton Partnership (TNP) collaborates with community organizations to implement successful bullying prevention programs for children of all ages. To address bullying at all ages, the Newton Public Schools developed TNP, a partnership of more than a dozen local agencies, including city organizations, mental health providers, community service agencies, parent-teacher organizations, and early childhood educators. The group supported the implementation of programmatic interventions at all grade levels and in early education and childcare programs. Early childhood specialists offer support to parents, preschools, and childcare providers throughout Newton. Teacher workshops include training in Second Step, an empathy development and violence prevention curriculum. A week-long Circle of Respect initiative provided activities for parents, students, staff, and the community to address bullying, including cyberbullying. All households in the community receive newsletters and electronic communications about bullying prevention activities and resources. Workshops on bullying prevention are offered for parents of children of all ages. Through its partners, TNP provides families and mental health service providers with resources, referrals, consultation, and counseling services. During TNP’s first three years, annual student surveys revealed a 55% decrease in the number of students who reported that they were harassed or bullied in school, and a 60% decrease in the number of students who reported being victims of cyberbullying. TNP is continuing its work by holding an annual bullying prevention training for all public school staff. In addition, TNP and the mayor of Newton convened a youth summit on issues faced by Newton teens, including bullying. Action plans developed at the summit are engaging children, parents, and community decision-makers in ways to work together to sustain bullying prevention activities into the future.